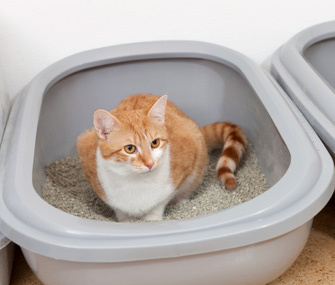 Cats with a urinary tract obstruction often strain to pee and their bladder fills up with urine. This is a potentially life-threatening emergency and needs to be treated immediately. If you’ve ever awoken to the soft pitter-patter of paws on your face, thrilled to the grace of a glorious sofa-to-loveseat leap or felt the telltale squish of a hairball beneath your bare feet, you’ll know that cats are special. So special, in fact, that they manage to bring their feline singularity to their expression of discomfort, too. Yes, cats are every bit as likely to occult any signs of pain, illness or discomfort as they are to demonstrate feline uniqueness in the above- mentioned ways. They are oddballs, indeed. Signs of injury like hiding, eating less and, when seriously afflicted, perhaps favoring a limb or failing to make their leaps as graciously as before, can be so subtle that most owners are liable to miss them. Now, that’s not to say that cat owners are clueless. In most cases they’ll observe a difference in their pet’s behavior. Nonetheless, they may misread the signs and fail to consider that what their pet is feeling is related to outright pain. Pain, some may assume, comes with yowling or growling, not with the more subtle changes I’ve described above. 1. Cat bite abscesses. When a cat starts to limp, most owners tend to think about strains and sprains as a result of all that feline athleticism. What most cat owners don’t realize is that cats rarely injure themselves in this way. Cars, dogs, coyotes and other cats tend to be more common sources of serious injuries. Of these, cat bites are the most typical among my younger, outdoor-venturing patients. Indeed, I’d venture to say that about 75 percent of my feline limpers are ultimately diagnosed as having received a cat bite. And a teensy-weensy bite wound is by far the most common finding — apart from the often too-subtle evidence of pain. Some owners may even notice a swollen area near the bite wound that can be warm to the touch or have some discharge. These cases often call for the area to be clipped and cleaned so the abscess can be drained, if needed. Some cats may also need antibiotics and pain medications. 2. Ingrown toenails. In my experience, older indoor-only cats who limp visibly in one or more paws are more likely to suffer from an oft-overlooked issue: ingrown toenails. That’s because owners aren't always aware that geriatric cats’ toenails tend to overgrow, sometimes curling painfully into their paw pads. But really, it can happen to cats of any age if you don't stay on top of nail trimming.